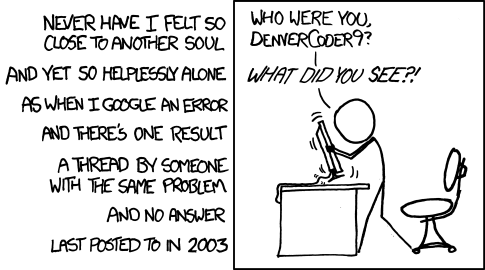 So a recent xkcd comic reminded me of a current problem I’ve been working through. So I’ve been messing with ZoneMinder off on and on the last couple of weeks trying to get that running again. And I swear I can relate to this problem all to well. I really don’t get why video surveillance has to be so complicated. Especially when it comes to configuring local webcams, when an app like Cheese can pick it up automatically and Zoneminder is such a chore. And in general Zoneminder is definitely an app that was written by a programmer and the UI and configuration is just so bad. This entry was posted on Sunday, November 20th, 2011 at 4:30 pm	and is filed under OSS, Technology. You can follow any responses to this entry through the RSS 2.0 feed. You can leave a response, or trackback from your own site.